32 cm tall (12.5 inches). 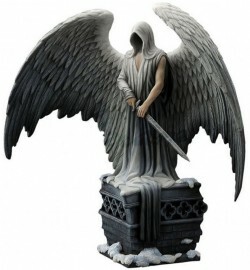 Impressive heavyweight cloaked guardian angel figurine standing with sword. Highly collectable figurine. Designed by L A Williams. Signed on the rear. Made from solid resin giving a smooth stony texture and a weighty feel. Arrives in an attractive box within protective high density polystyrene casing.